First-place: Ryan Cory-Wright, University of Auckland. Cost-recovering, revenue-adequate single settlement schemes for electricity markets. Highly commended: Melissa Welsh, Victoria University of Wellington. Modelling traceability in the dairy industry. Highly commended: Danielle Gatland, University of Auckland. Mapping electric vehicle range. 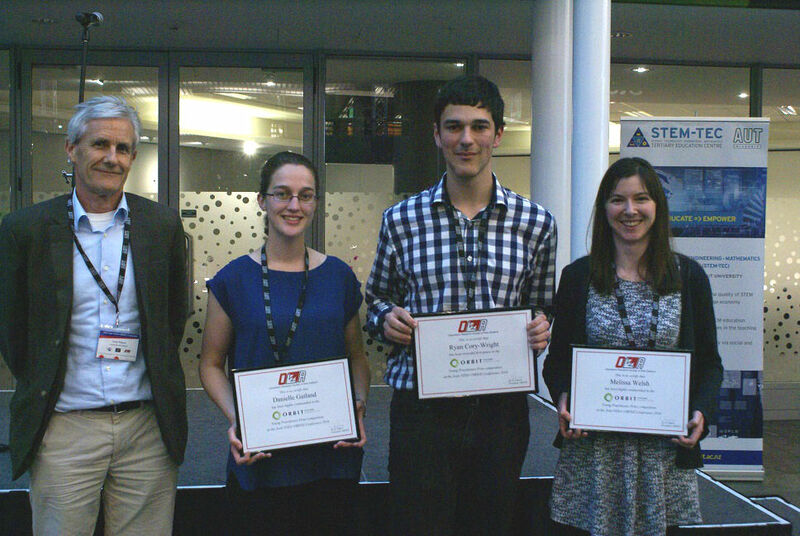 YPP Winners with Prof. Andy Philpott. From right: Melissa Welsh, Ryan Cory-Wright, and Danielle Gatland. Credit: Howard Henderson. Copies of their papers can be found on the proceedings page of the conference website, here. The Operations Research Society of New Zealand celebrated its 50th annual conference last week at the 2016 Joint NZSA+ORSNZ Conference held at the Auckland University of Technology. After the morning plenary on the first day of the conference, Prof. Andy Philpott (a former president of the society) noted that this is in fact the 51st anniversary of the society (having been established in 1965). However, since there was no ORSNZ conference in 1997 (members instead attended the APORS conference in Sydney), last week’s conference was indeed our 50th. A cake was provided at the morning tea break in celebration. The (envy-free) cutting of the cake problem was solved by having Andy Philpott and Grant Read jointly make the first cut. 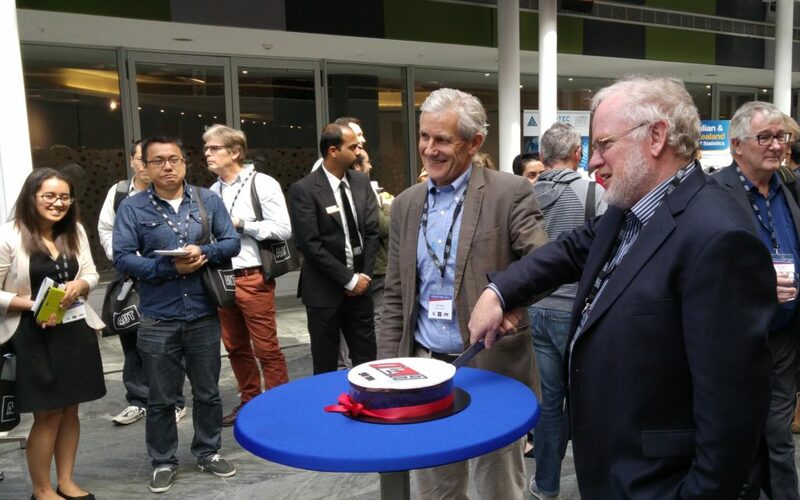 Andy Philpott and Grant Read cut the cake celebrating ORSNZ’s 50th conference.